Technology can sometimes be complicated, but you shouldn’t have to be a computer scientist or security expert to stay safe online. Protecting our users is one of our top priorities at Google. Whether it’s creating easy-to-use tools to help you manage your information online or fighting the bad guys behind the scenes, we’re constantly investing to make Google the best service you can rely on, with security and privacy features that are on 24-7 and working for you. Last year, we launched Good to Know, our biggest-ever consumer education campaign focused on making the web a safer, more comfortable place. Today, on Safer Internet Day, we’re updating Good to Know to include more tips and advice to help you protect yourself and your family from identity theft, scams and online fraud. You can also learn how to make your computer or mobile device more secure, and get more out of the web—from searching more effectively to making calls from your computer. 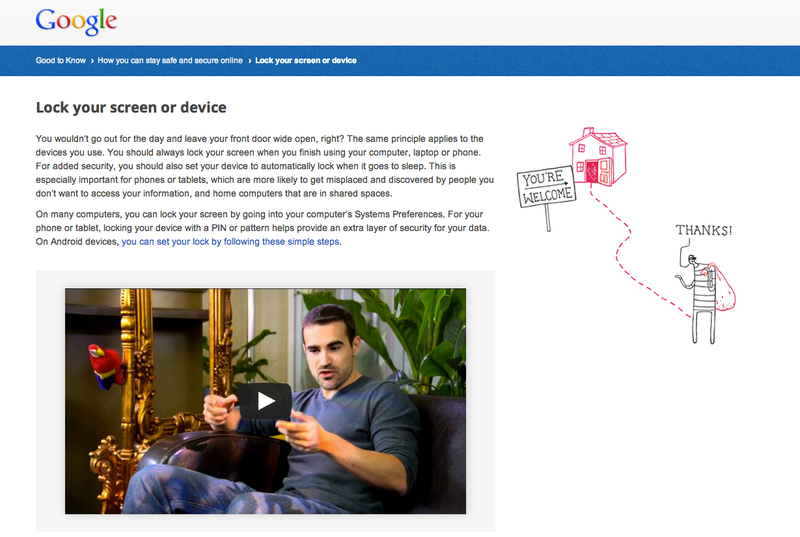 And you can find out more about how Google works to make you, your device and the whole web safer. For example, we encrypt the Gmail and Google Search traffic between your computer and Google—this protects your Google activity from being snooped on by others. We also make this protection, known as session-wide SSL encryption, the default when you’re signed into Google Drive. Because outdated software makes your computer more vulnerable to security problems, we built the Chrome browser to auto-update to the latest version every time you start it. It gives you up-to-date security protection without making you do any extra work. Even if you don’t use Google, we work hard to make the web safer for you. Every day we identify more than 10,000 unsafe websites—and we inform users and other web companies what we’ve found. We show warnings on up to 14 million Google Search results and 300,000 downloads, telling our users that there might be something suspicious going on behind a particular website or link. We share that data with other online companies so they can warn their users. Today also coincides with research by the Australian-based Young and Well Cooperative Research Centre which shows that when it comes to online safety, teenagers are often parents best teacher. The research, supported by Google, concludes that young people today generally understand the range of risks they might face online, and look at the take active steps they take to minimise them. Whether you’re 15 or 50, we know staying safe online is important to you—and it is important to us too. Please take some time today to make your passwords stronger and turn on 2-step verification to protect your Google Account. And visit our new Good to Know site to find more tips and resources to help you stay safe online.